Finding a Cameo Card is never easy. Finding one on a Topps card prior to 1987 can be downright difficult, as Topps was pretty stingy with the Action Shots from 1971 to 1986. Luckily, I was able to spot this one relatively quickly when fanning through the 1978 Topps set, and I was even luckier considering Roy White's card is #16. One turn of a 9-pocket page, and I have post-gold. Sweet. 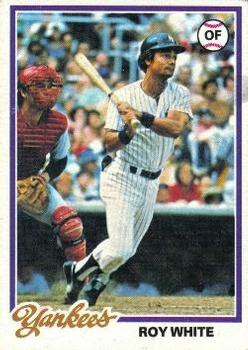 Anyways, today's Cameo Card is courtesy of Roy White who has a Hall of Fame catcher lurking behind him. Who is that masked man? Why it's Carlton Fisk of the Boston Red Sox! A rivalry game between the Yanks and Red Sox on a 35 year old piece of cardboard. Roy White is rocking the wrist bands. Judging by both Roy and Carlton's eyes, Roy has blooped one to short right-center. Ok, this is a total guess, but it's my story to tell. Fisk is in all red gear, and has on the old washboard chest protector. Faceless fans courtesy of the Topps Airbrushing Department. A dugout full of Yanks. Just found this post 5 years after the fact. I have an Alomar collection and am going to pick up this Gwynn card just for fun! A card on a card - love the fact that you found this. Ah well...still love that find!